Hundreds of residents of a luxury New Jersey apartment complex were evacuated as a blaze swept through Edgewater’s Avalon building on Wednesday night. A local state of emergency has been declared, with schools closed and roads restricted. The fire broke out around 4:30 pm, sending thick plumes of smoke high into the sky, above the Hudson River. It happened 15 years after another blaze burned the same complex to the ground as it was being built, NBC New York reported. The 408-unit building was quickly evacuated and firefighters struggled to contain the flames, hampered by winds and frigid temperatures. After firefighters first responded, the fire was under control for a little while, but then grew worse in the hard-to-access rear of the complex. Edgewater Fire Chief Tom Jacobson said on Thursday that the “lightweight” wood structure of the building with a truss-styled roof contributed to the rapid spread of the blaze. “If it was made out of concrete and cinder block, we wouldn’t have this sort of problem,” he said. “I don’t know what to expect. Now, I have nowhere to go. And I need a toothbrush," Sterling, who was forced to move to a hotel, added. If anyone here in edgewater lost there home due to the fire in avalon , my home is welcomed ! ! A temporary shelter for residents was established at the elementary school across the street. Some of them had returned from work to find their homes wrecked. No serious injuries to civilians or firefighters have been reported. 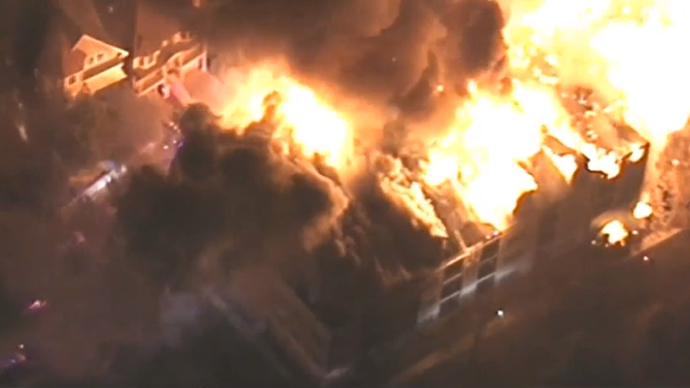 Authorities said everyone in the four-story building apparently managed to get out safely, nearly 1,000 people were displaced from their homes, according to NorthJersey.com. The cause of the fire has not been determined yet. With plumes of black smoke from the blaze, New York emergency officials advised residents in Manhattan and the Bronx they might see and smell smoke. According to #Edgewater Mayor minor injuries and no fatalities in the #Avalon apt complex fire in Bergen Co.